On Oct 3 (possibly using the Kavanaugh drama to divert press attention), develper Adrian Washington's Neighborhood Development's subsidiary 1100 Eastern LLC padlocked three Black-owned businesses and a church in the Deanwood neighborhood in NE. 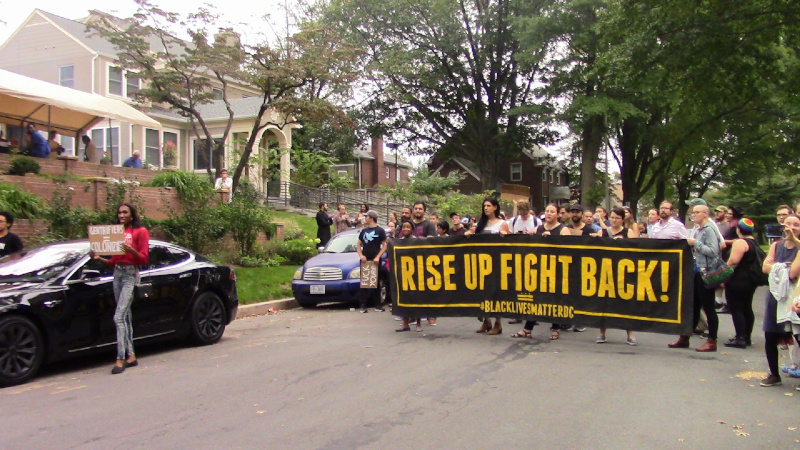 On the 6th of October, Black Lives Matter and other activists paid a visit to Adrien Washington's cushy home near Rock Creek Park and 16th st.
As the march wound from 14th st to 16th st and finally up Shepherd St to the developer's home, marchers loudly chanted anti-gentrification slogans and asked Adrian Washington's neighbors to have a chat with him about the disruption he had brought to the neighborhood. 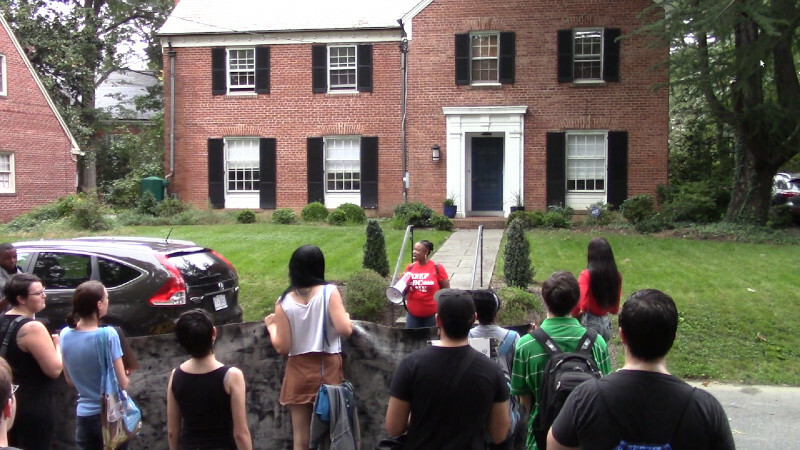 Marchers said disruptions such as police jump-outs, illegal evictions, and this padlocking were what Adrian had brought to their neighborhoods east of the Anacostia, so now residents near Rock Creek get a taste of disruption for themselves. The padlocked businesses included the Nook's barbershop, the Little Jewels Daycare center, and even an African-American church. The claimed excuse was environmental hazards left over from when a dry cleaner occupied the properties, but that hazard has been known at least since Adrian Washington's first got a $11M grant from DC to redevelop the properties supposedly for affordable housing. The sudden padlocking and letter sent to tenants did NOT come from eviction court and in fact was an attempt at an illegal eviction without benefit of landlord-tenant court process. In the end, the attention of attorneys forced the developer to let at least Nook's reopen as of October 6, at least temporarily. Nooks is a business that has previously been associated with Black Lives Matter after incidents over the summer where MPD staged jump-out operations and provoked fights right in front of the premises. This was right about the same time Adrian Washington was getting the grant to "redevelop" the area. Thus, the police aggression was a textbook example of how police serve as the armed forces of developers and gentrifiers. This has changed little since the US Cavalry backed up trespassing settlers who built cabins on Indigenous land over the objections and active resistance of the lawful occupants. In terms of current landlord-tenant law, for a landlord to be able to padlock a property on 24 hours notice and then lock a tenant's posessions inside would be a very considerable escalation over current eviction procedures, and would in fact make it unsafe for anyone to move personal posessions or instruments of business into any building that they did not own outright, free and clear with no mortgage outstanding. It is not legal in DC and to this author's knowledge is not legal anywhere in the so-called "United States." Marching past a Russian Orthodox Church holding a big outdoor event. 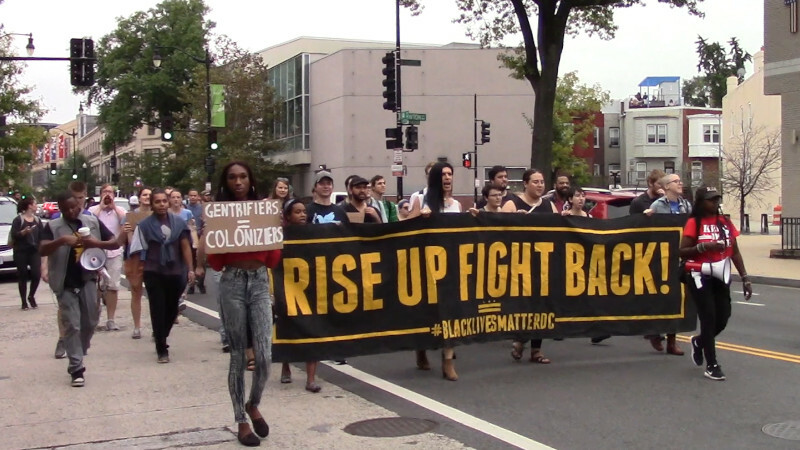 Most of those attending that event seemed to pointely ignore the protest, making them complicit in what Adrian Washington is doing.